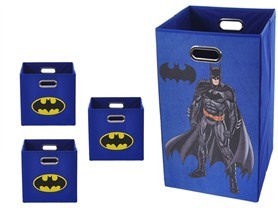 Hurry over because today only you can get this 4 Piece Batman or Superman Storage Bundles for only $38.99 (Retail $67.00)! Keep laundry and toys tidy and organized with the 3 storage bins and 1 folding laundry bin. Perfect for the bathroom, closet or laundry room. It folds flat when not in use for easy storage, and the lightweight design features metal handles for effortless carrying. Each bundle contains 3 collapsible storage bins and 1 collapsible laundry basket.